Drinking crisp Windhoek lager at a party in the Namibian Embassy in Moscow was the first real exposure we had to this country so far from Russia. The event celebrated 20 years of independence from South Africa and brought together Namibians of African, German and Afrikaans decent. The photos on the embassy’s wall of the country’s varied but arid terrain stuck in our mind. One year later we were able to explore this modest and often overlooked African country. Namibia is becoming increasingly popular with adventure tourists, exploring the amazing possibilities from fishing on the desert coastlines, going on safari or watching the sunrise over vast dune fields. It is, however, the second least densely populated country in the world after Mongolia and is far from busy. Even the capital city, Windhoek, feels smaller than it really is with the suburbs hiding behind the surrounding hills. The city itself is safe and modern and brings together Namibia’s diverse cultures. One can just as easily see businessmen as traditionally dressed Himba woman wearing nothing but a skirt and beads. However, Namibia’s beauty lies outside its towns and leaving them behind is when the adventure begins. Before you depart Windhoek stock up on fuel and water, check your tyres and if possible buy an extra spare wheel. 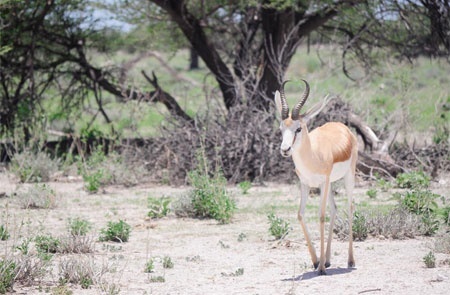 Five hours south lies Namibia’s top tourist attraction, the sand dunes of Sesriem. These are the biggest sand dunes in the world and are located hundreds of kilometres from the main tar road. Climbing Dune 45 for sunrise is a must. This means getting up when it is dark and waiting for the 5am opening of the National Park’s gate and then driving like a maniac for 45 km. The rush is to get to the dune’s base in time to climb up the spine before the first shards of light start streaking across the African sky. The colours of the dunes shift from blues to reds as the sun rises and the whole experience makes you feel like you are on the set of Lawrence of Arabia with Peter O’Toole. Half an hour further into the dune field is Sossusvlei. The flei (or marsh) is a salt pan where a collection of trees sprout out the desert, surviving on a meagre trickle of water from a river that peters out into the sand. Sitting a few kilometres away is Dead Vlei. About 1000 years ago it was lush, like its sister vlei, but now is cut off completely by the shifting sand leaving a baked dry lake bed. Eerily, the area is filled with the black skeletons of dead trees silhouetted strikingly against the red dunes. Some of the locals believe this area is sacred and it is easy to see why when surrounded by such a mystical sight. It’s a hard day’s drive leaving the dunes to get to the coast. The road which passes through the Tropic of Capricorn is poor and seems to be made from tyre-poppingly sharp bits of flint. You are likely to pass only one of two other vehicles on this route but you will see many springbok, oryx, zebra and maybe a few warthog. Thankfully, you eventually join a four lane smooth gravel road that leads you into Swakopmund on the Atlantic Sea and one of Namibia’s few towns. Swakopmund is a pretty costal town and the gothic script on the walls of the timber framed houses give you the unique feeling of Bavaria on the African coast. It is the biggest settlement outside of the capital and a haven for vacationing locals and tourists from other African countries. Find a small beer house to drink the locally brewed weizenbier-style Camel- Thorn Lager, sit back and enjoy watching the fascinating mix of cultures perambulate by. The drive North, towards Torra Bay, is along a thin ribbon of road made of crushed rock salt. It has been polished by so many tyres and so little water that the surface is Formula 1 smooth. The single defining feature in this part of the country is the road dividing the desert from the shoreline. About 100km north of the town is the Cape Cross Seal colony. You can smell the mass of 100,000 cape fur seals miles before you can see them. The sheer number is overwhelming and walking in between them is noisy, pungent but truly fascinating. A further 100km north of Cape Cross begins the aptly named Skeleton Coast. The coastline is littered with whale bones and whaler wrecks, where the crews almost certainly died when their water supplies ran out. The area was declared a National Park in 1971 to protect this unique ecosystem, thus ensuring that it remains empty of humans and as desolate as ever. However, for two months a year the Namibian Government allows fishing and camping at the remote Torra Bay. During these months a community of nearly one hundred and fifty Namibians, of hardy German and Afrikaans background, settle in the desert and live together enjoying some of Africa’s best beach fishing. 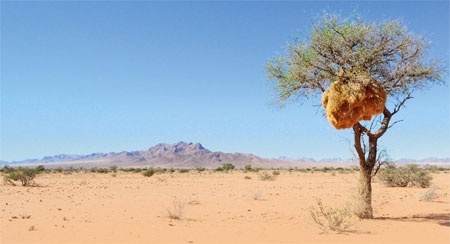 Despite only receiving 10mm of rain a year the Skeleton Coast Park is home to many well adapted species including some of the world’s last desert dwelling elephants. 250 km west of the Skelton Coast, and just out of the desert, is Twyfelfontein. This area is famous for the hundreds of examples of, well preserved, bushmen’s rock carvings dating back about 6000 years. 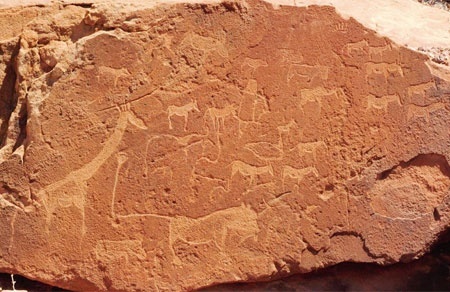 These simple depictions of game, maps and animal prints were used to educate their children and tell fellow nomads where the waterholes were. The animals that inspired these carvings are no longer abundant in this area, but a half days drive through the spectacular Damaraland countryside takes you to Etosha National Park. The Park is one of the best places to see southern Africa’s great animals at close quarters. It is huge and takes about three days to drive across. Zebra, ostrich, antelope and giraffe are common on the winding tracks, but lion, elephant and rhino are a bit more elusive. For your own safety, and that of the animals, you are kraaled in one of the three camps from sunset until sunrise. Thankfully, the game spotting does not end at dusk, as each camp boasts a flood-lit watering hole where you can sit with a camera and a pilsner and wait to spot the arrival of some nocturnal game, like the leopard. There is so much to see but a lot of luck and a little bit of persistence is the key to enjoy this wilderness. Leaving the Park’s eastern gate puts you only about six hours north of Windhoek but that is not all the country has to offer. Fish River Canyon (the second biggest canyon in the world) and the abandoned German Duwisib Castle are also highlights. 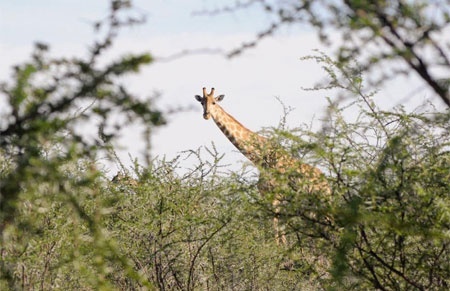 There are countless other sights worth seeing but the distances are vast, planning and listening to good local advice are essential to enjoying the untouched beauty of Namibia. But before you go learn how to change a tyre.